Are you a full time author or do you have another job aswell and if so how do either or these fit in with writing time? *I’m a full time writer without a day job, and I am thankful for that! *I usually write daily but there are days when other things get in the way AND I need a day off to regenerate! *This is a challenge and I’m still working on it—for my paperbacks I think doing readings and placing them in genre similar bookstores is good—but of course that isn’t like selling 1000 kindles—still working on how to get my readers connected with my books! *Hope this won’t be offensive to your readers but…he’s a priest gone bad with a sorceress mother! If you have to write any fighting scenes, what are your best tips of how you create them? *Yes I do write them and yes I sometimes tear up! *Parallel with Scotland (another reality) but has all the earth-like attributes. *This one got so long that I had to divide it up! The one I’m working on now may do the same thing…I like series both to read and to write—gives the reader a longer time with characters one connects with. * I do have several sub-plots going through the narrative but in the end they all connect. Can you tell us a little about one of your sub plots in your latest book? *I can’t imagine it, really—I had this book edited and went through it seven or eight times—if someone just doesn’t like the story then that’s understandable—I know it could be improved-- there’s always room for improvement, but I think it’s a good story the way it stands. 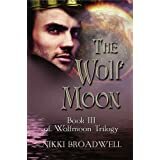 Would you like a FREE e-copy of The Wolf Moon? All you have to do is leave your contact details in the comments and this will be forwarded to the main host of Nikki's amazing Tour.